* Light Rail Update by Winsome Bowen, City of Miami Beach Deputy of Transportation -Based on resident feedback, the commission has changed policy. Instead of self funding a light rail that circles South Beach, the project will not move forward unless the county first funds a link from Miami Beach to the mainland and the project receives resident approval in a referendum. These steps will make it possible for the project to receive Federal and State funding. * Trolley Expansion Update by Milos Majstorovic, Transportation Operations Supervisor (Trolley and Transit) , and Jose Gonzalez, Director of Transportation – Service from the $.25 Local bus, run by the county, will end this year and the route will be seamlessly continued by the free trolley, run by City of Miami Beach. Twelve custom made “stepless” trolley cars, costing $3.6M, will run a circular route in South Beach, to include stops in Sunset Harbour, plus an east to west route on 11th Street will be added. This will all be accomplished by November 2017. In the meantime, mid beach and north beach trolley has launched. * Water Taxi Service Update – Service began Dec 30, 2017. The route is Purdy Marina to Bayside and the Omni. The cost is $10 one-way, $20 round trip. For now, the taxi will only run on Friday, Saturday and Sunday with plans to expand service throughout the week depending on the ridership. 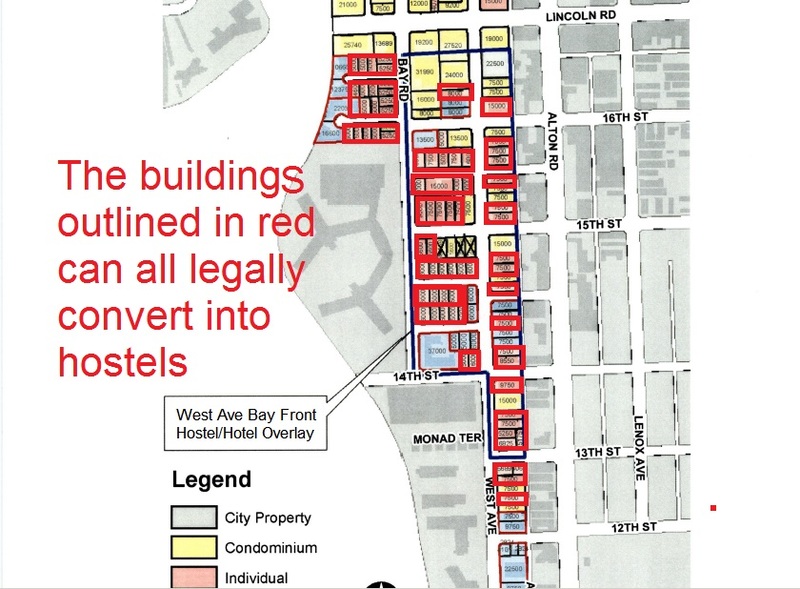 * Ban Hostels in West Ave neighborhood- Though hotels were banned in 2010, suite-hotel and bed & breakfast (which can turn into hostels), are still legal in our neighborhood. The Commission shows no appetite to ban suite-hotel and bed & breakfast, instead the proposal is to create strict criteria such as limiting occupancy per unit. The Planning Director stated at the previous Land Use meeting that the 2010 hotel ban already prohibited alcohol to be served in Suite-hotels and bed & breakfast. * Developer is paying city $665k for an easement over Alton Alley (Near 17th Street) – Commissioner Arriola is proposing to allocate the revenue exclusively for West Ave neighborhood amenities. When several suggestion were presented, membership was strongly in favor of funding the Baywalk. * Medical Marijuana – The commission is in the process of deciding where to allow the location and number of dispensaries in Miami Beach. Membership was generally in favor of locating dispensaries throughout the city, even in our back yard, Alton Rd. But several folks expressed concerned about safety (since it is a cash only business), and appearance of the outside of the building and the signage. Commissioner Michael Grieco (* that’s G-R-I-E-C-O) assured us that the commission is creating strict criteria to mitigate any of problems. * You had to be there to get the joke. * Illegal Short term rental Fines were increased for renting & advertising; violation of 30 days or more change from $500 to $5,000.00. First offense of renting or advertising change from written warning to $1,000. There was uncertainty if STR is banned in all three zones of our neighborhood, RM-3, RM-2, and RM-1. We will follow up on specifics of the law with Code Compliance at next Wavna meeting. * Up Zone Dade Blvd and Purdy Ave to 90 ft height, currently 50 ft – Planning Board 11/15/16 went against city staff recommendation and approved height increase. It was mentioned that that the Planning Board is stacked with developers and real estate agents who profit from over development, that there is little representation of resident concerns. Membership was distressed about height increases that may be proposed in our neighborhood. * Terminal Island Project proposes height increase of 300’ height, currently zoned for 50’. Project includes residential, commercial, restaurant, and marina. There was discussion on whether there was a public benefit. The developer will make presentation at next Wavna meeting Feb 7th. * New landscaping and lighting under the flyover. Commissioner Malakoff noted that more decorative lighting and beautification is still in the works. * Miami Beach was re-districted so our new Congressperson is Illeana Ros-Lehtinen (R), was Debbie Wasserman Shultz (D). Membership seemed aghast. * Wavna Newsletter had 53 emails ending in bellsouth.net bounce back. If anyone out there knows solution please contact wavna305@gmail.com . Note, Bellsouth uses the yahoo server. * Residents other concerns included : proposed rooftop alcohol at 1212 Lincoln; Uber blocking traffic in front of The Flamingo at 1500 Bay Rd; a drone with camera flying near Mirador windows which infringes on privacy; loud motorcycles without mufflers drag racing on West Ave; loud dog barking from a boat docked near the Waverly; stop sign needed in front of the Bentley; traffic backed up on West Avenue approaching MacArthur Causeway because drivers not aware of dedicated lane; garbage and overall filth in front of Publix on 6th St; homeless issue seemed to improve. This entry was posted in Uncategorized on January 5, 2017 by wavna305.